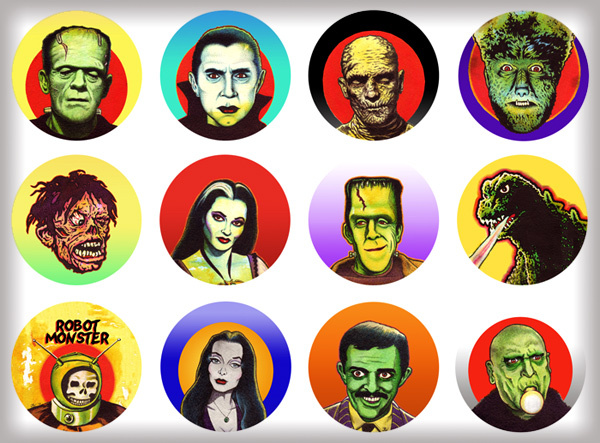 For a limited time, I take fiendish delight in offering this "deadly dozen" set of pinback monster buttons: Frankenstein's monster, Dracula, the Mummy, the Wolf Man, Shock Monster, Lily Munster, Herman Munster, Godzilla, Robot Monster, Morticia Addams, Gomez Addams, & Uncle Fester, lovingly rendered by yours, truly. All buttons are 1" in diameter (a bit smaller than they appear here). I'll even throw in a bonus "MYSTERY BUTTON" (my choice of a design not pictured here) for a total of 13 (unlucky) buttons! Price includes shipping. I accept PayPal.